Obviously we had to cover this specific restaurant this year. It essentially says that I did it. You know, and every other guy called Mike in the world. 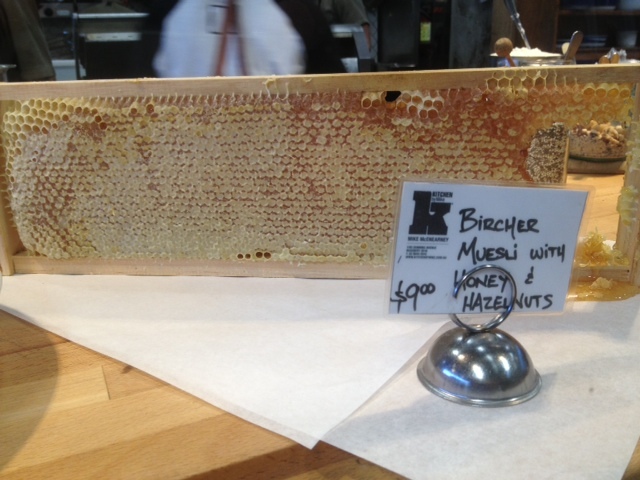 Still, the idea of seasonal, sustainable food from my namesake was too much to pass up. Rosebury, is the new ‘hip’ place to be in Sydney; Cafes and Restaurants are scattered amongst the large industrial warehouses and seconds shops. Don’t let that put you off however, there are some amazing gems waiting to be found, and Kitchen by Mike is one of them. I am a very lucky woman, because I have my own Kitchen By Mike at home, and I think I prefer my one because Home Mike cooks shirtless; Restaurant Mike does not (well I am making an assumption here – he may very well cook naked). Restaurant Mike does make up for this lack of naked cooking with his beautiful, quirky, organic menu. 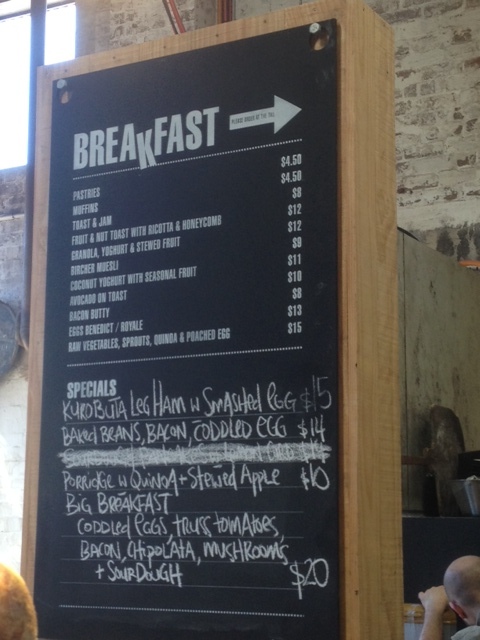 Kitchen by Mike has collaborated with renowned furniture company Koskela in a large, open industrial space. Here art, furniture, crafts and food collide; my favourite things. The dining area is a large open space with long communal tables and sparse furnishings (the wine list printed on the back of the cutlery tin – very cute). In order to order food you must jostle your way into the line, giving you time to drool over the cabinets and an opportunity to change your mind several times. The food is simple, and the menu is designed daily depending on what produce has been picked up from the markets – this is his selling point; tasty, nutritious, simple seasonal food at good prices. There is no wanky, pretentious food here! 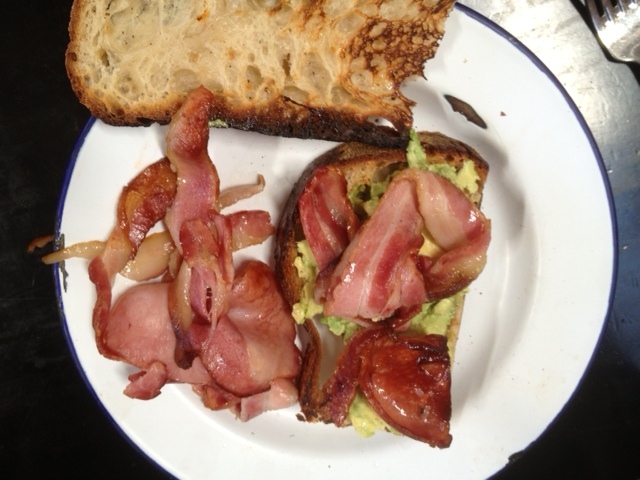 There were so many great options on the menu that I couldn’t make a decision and I was too hungry to risk having an unsatisfactory meal, so I went with the simple Avocado and Bacon on toast combo. With a simple meal like this it is easily exposed, so I think that this is a good ‘tester’ of the quality of the ingredients and the ability of the Chefs to make it taste phenomenal. The organic Bacon was cooked to perfection (and there was a lot of it), and the generous Avocado had been dripped in Basil Oil. 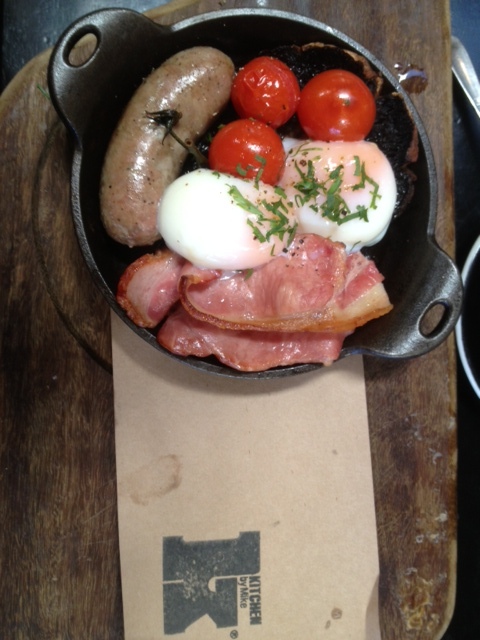 The combo was exceptionally satisfactory and when washed down with an organic coffee left me one happy little vegemite. Given the location and the quality of food, the prices are very good – so good you could pop next door and spend an obscene amount of money on the fancy cushions. KBM will certainly become a new favourite of mine (outside my home KBM). 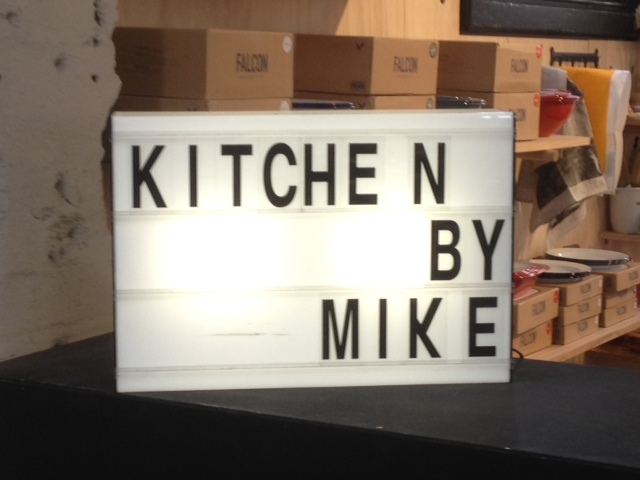 Yeah, so Kitchen by Mike, who thought that meant we just stayed in and I cooked? Fair enough assumption I suppose. Well, NN certainly gave it a good review, allow me to elaborate on this and explain why a place like this is such a great option. Eating seasonally, is to eat food that is available in your region, and to some degree country, in the season you are currently in. So eating cherries in Australia in August; they’re most likely flown in from California US, apples too are out of season this time of the year in Australia. Cost: Eating foods out of season that have been flown from another country, possibly even across the globe, will not only result in a higher price for you, but a cost to the environment for extra greenhouse gases which, in all reality if seasonality was followed, wouldn’t be necessary. Culture: In Australia two supermarket chains starting with C & W control 80% of the grocery market (which I personally avoid if possible). This not only means we bow to these large dictators on price, but also quality. Large producers tend to pump out crops and animals quickly and cheaply in order to get it to store and at a cheap price. What this means is that the culture of local production, markets and general agriculture- one that was an absolute basic staple in the societal development of humans- is lost to huge companies, and the nutrient dense, flavour rich and ethically grown food is slowly being beaten out of society all together. This last point is key and why places like Kitchen by Mike (not me) are so goddamn important. Not only cafes and restaurants like this, but local farmers markets – run by actual farmers, not re-sellers from wholesalers – are a vital cog in keeping this seasonal and sustainable farming afloat. This is the exact area where many people question the cost, as is often the first worry- how will this stuff affect my pocket? Well, local farmers markets are a hive of trade; not only a great place to meet the person that actually grew or raised the food you’re about to buy, but also a place to cut out the profit centred middle man and buy at competitive rates from someone who could do with your hard earned cash, much more than Mr Coles or Mr Woolies, if you catch my blatant drift…. No, I kid. But in all seriousness, this is all too often an issue people wash their hands of, because “What can I do?”, well YOU ARE EXACTLY THE PERSON THAT CAN MAKE A DIFFERENCE TO THE WAY MEAT AND PRODUCE IS FARMED AND SOLD. Each of us, if we send a message to large corporations by buying local, seasonal fruit, vege and meat are saying that the natural and ethical production of our food is important to us and generations to come. Buying simply because it’s on our TV screens and ‘at rock bottom prices’ can’t be enough, there needs to be some heart and humanity to how to shop and eat. There, now please, this week go out and find a supplier for one of your favourite foods that is local and produces seasonal food. Find one eatery that does the same and see how good things can be if you step out from the factory and into diversity. And for those who want my opinion, in case you hadn’t picked it up yet, Kitchen by Mike is the goods. 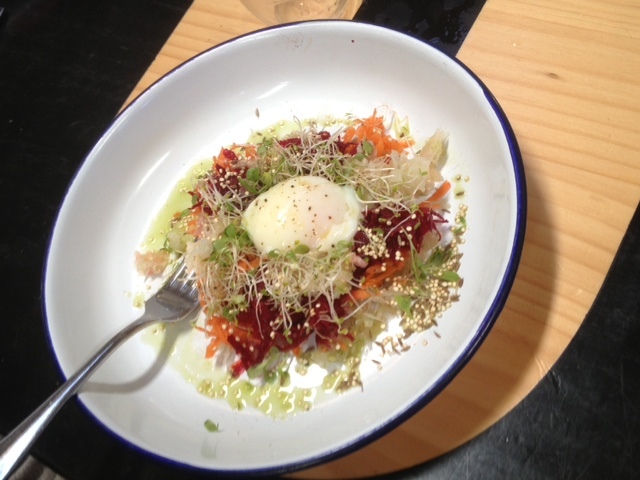 Beautiful food, with a conscience, something NN and I are passionate about. 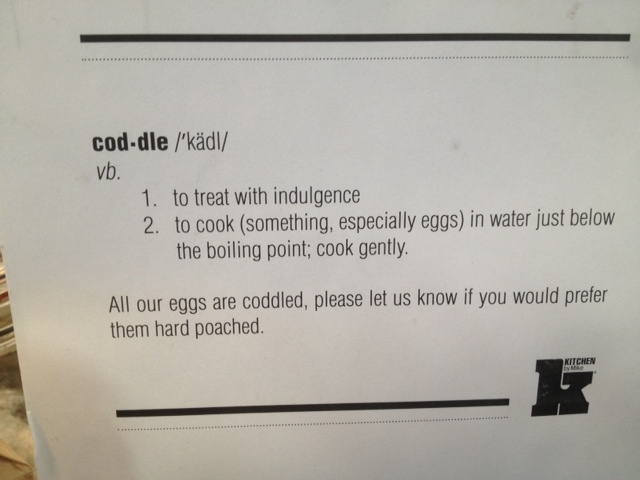 Plus I learnt about ‘coddled’ eggs, awesome! For more on this, check out Slow Food Sydney, a part of the global movement to reintroduce seasonal food and local, sustainable farming. Which is also a valued reference for some of the above information. Spot on MC – although I think the soapbox may be put to one side now. This place is the muts nuts. We have been several times after our first brekkie and think the food is always impeccably high grade…and tasty…and I hate to say it, you just can’t pass that bread by – it is awesome! Thanks for the feedback Andy… Best thing about a blog… soapbox is entirely mine to pull out if and when I like … haha. But point taken! Yep, great food done well. Will be returning for sure. Another great Blog MC! Love the Soapbox since it’s only by broadcasting about ‘buying local and seasonal’ that (hopefully) people will give W&C a wide birth! BTW, a friend of mine has a new site in beta (www.organicfood.com.au) that offers market locations, organic food stores by area, as well as sound nutritional advice. They used to deliver but have pulled back and are now setting up to be an information source only.